This patient had developed pronounced stretch marks, stretched abdominal skin and wide separation of abdominal muscles from her pregnancies. Abdominoplasty and liposuction of flanks was done to achieve improved contour, reduction of waist size, flattening of abdomen, enhancement of umbilicus and removal of most stretch marks. Abdominal muscle separation was corrected to restore her pre-pregnancy muscle tone. No drains were used. Abdominal wall bulging and stretched abdominal skin is obvious in her pre-operative photos. She also had umbilical hernia. There were fatty deposits on her flanks. Abdominoplasty, repair of umbilical hernia, umbilical re-shaping, abdominal contouring, removal of excess abdominal skin and liposuction of flanks was done. Improved contour and figure is highlighted in her after surgery photos. No drains were used. This patient is in her early 40 s. Before surgery photographs show significant excess skin in her abdomen and fullness on her flanks from fatty deposits. Abdominoplasty and liposuction of flanks was done. 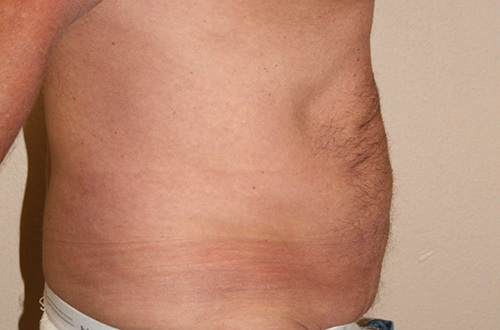 Post-operative photos show markedly improved abdominal contour and waistline. Belly button looks natural. This patient is in her mid 30s. She has had multiple pregnancies. Before photographs show stretched abdominal muscles, abdominal bulging and stretch marks of abdomen. Entire abdomen and flanks have extra rolls of skin and fat. Belly button is hidden in tissue folds. After tummy tuck photos show how all these issues were corrected. She has a very nice belly button- a hallmark of good tummy tuck. Abdomen is flat. Waist is slimmed because of liposuction and strategic frontal pull on flanks skin. Surgical artistry is required to properly redistribute flank tissues. Most of stretch marks have been removed. Scar is well hidden in her under garments. Before surgery patient has fatty bulges on her abdomen and flanks. Belly button is distorted. Abdomen has excess skin, and muscles of abdomen are stretched. During her tummy tuck muscles of abdomen were tightened to flatten her tummy. Belly button was remodeled and reshaped. Excess abdominal fat and skin rolls were removed. Liposuction of flanks was done to define her waistline. Thus excellent abdominal contour and shape were achieved in this patient as seen in her after pictures. This patient is in her early 30s. Pregnancies have resulted in marked stretching of abdominal tissues and skin. Skin is forming multiple folds. Belly button is hardly visible. It is lost in tissue folds of abdomen. Extensive stretch marks are present. The after images show front and profile views after surgery. Tummy Tuck and liposuction of flanks was done. Beautiful outline and shape of belly button defines a beautiful tummy. Liposuction of flanks and proper handling and repositioning of tissues of abdomen delivers defined shape of abdomen.